You may have been startled on Oct. 3 by a text message indicating “THIS IS A TEST of the National Wireless Emergency Alert System”. The message was a “Presidential Alert” sent by the Trump administration to 225 million wireless telephones. The Associated Press reported that FEMA officials estimated that about 225 million devices would receive the alert at about the same time, but the message was broadcast by cell towers for 30 minutes so some people got it later than others. Some got as many as four alerts on their phones; others didn’t get any. In a real emergency, devices would get the alert at the same time or as close to the same time as possible, the AP report said. A second alert on television broadcast and radio went off at 2:20 p.m. EDT. The TV and radio alert has been tested for several years. 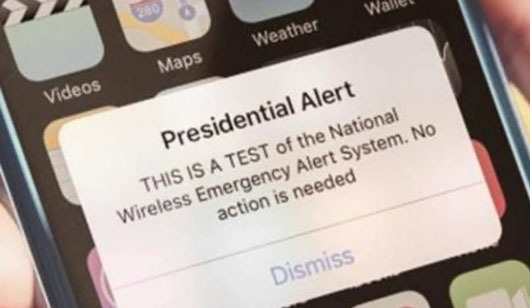 The system test is for a high-level “presidential” alert that would be used only in a nationwide emergency. It was completed in coordination with the Federal Communications Commission. Reaction on the Left ranged from conspiratorial to outrage to satire. Late Show host Stephen Colbert suggested a workaround for not being able to opt out of the alerts: “Just make sure your software is up to date, open up your control settings, go to control center, customize controls and then” hit your phone repeatedly with a hammer until it’s totally destroyed.